One hour to rewrite the past . . . For seventeen-year-old Emerson Cole, life is about seeing what isn’t there: swooning Southern Belles; soldiers long forgotten; a haunting jazz trio that vanishes in an instant. Plagued by phantoms since her parents’ death, she just wants the apparitions to stop so she can be normal. She’s tried everything, but the visions keep coming back. So when her well-meaning brother brings in a consultant from a secretive organization called the Hourglass, Emerson’s willing to try one last cure. But meeting Michael Weaver may not only change her future, it may change her past. Who is this dark, mysterious, sympathetic guy, barely older than Emerson herself, who seems to believe every crazy word she says? Why does an electric charge seem to run through the room whenever he’s around? And why is he so insistent that he needs her help to prevent a death that never should have happened? 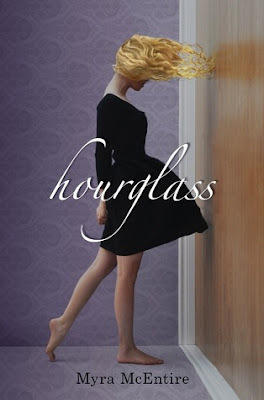 Full of atmosphere, mystery, and romance, Hourglass merges the very best of the paranormal and science-fiction genres in a seductive, remarkable young adult debut. Thanks to Egmont USA we have a copy to send on tour! To read an advanced reading copy of Hourglass as part of Fire and Ice ARC tours, fill out this form. When is the tour beginning, I want to make sure that I am not on vacation when it may arrive so I can get it out in the time I am alloted. Thanks for the awesome blog tour offer! Here is the link to my review from the tour. I forgot where to post it.